Several convict butchers were assigned to Tocal and their job was to slaughter cattle, sheep and pigs to provide the weekly meat ration for the 33 convicts working on the estate. Ironically, one of Tocal's butchers was twice transported for cow stealing. James Brownlea was first convicted of the offence in Ireland, received a seven year sentence and was assigned to Tocal on arrival in NSW in 1828. 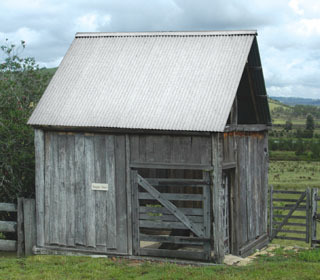 He worked at Tocal until he obtained his Ticket of Leave in 1833. As a free man Brownlea married in 1834, despite having a wife and two children in Ireland. In 1838 he was again convicted of cattle stealing and sentenced to Norfolk Island for life, leaving his pregnant wife and three young children in Maitland. Below: Tocal's slaughter house as it stands today. Another butcher was assigned to Tocal in colourful circumstances. John Lynn had for many years been assigned to a master in Sydney who allowed him to live as a free man and run a butcher shop in Pitt Street. Unfortunately in 1836 the authorities discovered Lynn's premature freedom and sentenced him to 14 days on the treadmill for 'living in an improper state with a woman' . He was then reassigned to Tocal where he remained until he received a Ticket of Leave in 1837.